chlorhexidine is a very good for killing bacteria and fungus. Most dental offices carry chlorhexidine mouth rinse. You certainly wouldn't want to drink it, but the little bit that would remain on her foot wouldn't be harmful to her if she licks her foot later. You could wet a cotton pad with it and hold it on the foot for as long as she will tolerate it. As well, if you want a totally natural laundry detergent you should check out soap nuts. You can purchase them on Amazon or your local organic grocery store. Hopefully everyone is better soon! I never heard of soap nuts, and I searched them online. They are so cool! Thanks for the suggestion! We will definitely try chlorhexidine if the anti-fungal cream doesn’t work. Chlorhexidine comes in various solutions - some are cleaning solutions. If you go that route, make absolutely sure it is an oral mouth wash.
Soapwort root pieces need to be boiled in water. This soapy brew is then used for washing or bathing. Thanks! I never knew there were so many natural soap options. Will definitely make sure it is an oral chlorhexidine if we use it. The nicatin cream is not working as well as we like. It is helping the fungus, but not making all of it go way. We might try the chlorhexidine. One other question is do we actually really need to treat it? My gps don’t seem in pain, are there any bad long term effects of having fungus in their feet? If it's looking better, that's good. Ask your vet what he/she thinks the next time you see them. Keep in mind the chlorhexidine is very drying. You must dilute it. I don't know how much foot fungus would be acceptable. You don't want to find out later there is also a bacterial infection. I'm not sure if Pigsy has a UTI. This afternoon I was watching them play in their cage, and Pigsy went to the littler box to go to the bathroom, and I noticed her pee was a dark colored. I'm not sure if it's normal, it looks orange/pink. 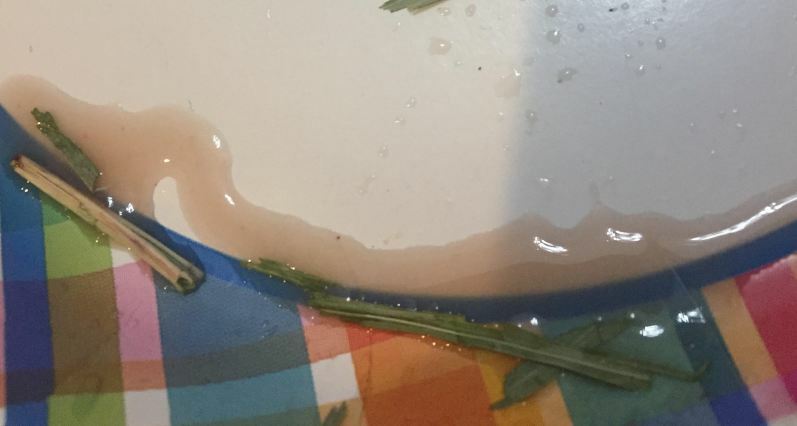 Do you think it's a blood/UTI or normal? Here you go. I kind of think this is not significant. Does not look like blood. Lots of foods change the color of piggie (and human) color and smell. The most obvious is beetroot. A couple weeks ago, Jasmine and Pigsy’s fungus started getting worse, and I looked for things that could be causing it. I realized that the micatin cream that we were giving them expired over a year ago! We bought some new cream called clotrimazole, and have been applying it to their paws once a day. We also have been spraying down the cage and pigloos with vinegar once a week because we heard it kills fungus. After getting the new cream, their fungus had been getting better. However, they are not technically our pigs- a farm near us owns them, and needed a trustworthy person to watch them for the winter because the room they live in doesn’t have heat. We are giving them back to the farm soon, and I really want this infection to be gone before they go back. We got some chlorhexidine do we will be applying that in addition to the clotrimazole, and we hope that it well help the fungus go away faster. How much do we dilute the chlorhexidine (we got dentahex, 0.12% Chlorhexidine)? How long does usually take for a fungal infection to go away? Look over www.guinealynx.info/antiseptic_solutions.html and www.guinealynx.info/pododermatitis.html if you have not. Be careful with the Epsom salts. I wish I could tell you how long it would take to get rid of the fungus but I don't know. Sorry, I couldn’t find that article on chlorhexidine! Thanks so much for it. Wow, it is much harder than I imagined to get them to soak their feet! We actually got a different brand (it is an oral one), and it is really sweet, so all they are interested in going is trying to drink it! Also, the piggies are going back to the farm on Saturday :,( I’m hoping that someone will be able to treat their fungus there, since I only visit once a week because it is 25 mins away from me. An upside down bottle cap makes a good piggy foot bath. Great idea! Thanks so much! Will definitely try that tomorrow. Hi everyone! I haven't posted in a while, I need help on a situation with the piggies.Sorry my post is kinda long! First of all, before I explain my situation, I want you to understand although I am part of a 4H club, I am NOT trying to raise support for 4H by posting this. I understand that many 4H clubs support breeding and using animals for meat- my 4H club does not. Our animals have the best lives we can give them, and we always put their happiness before our own wants. They are not sold or used as A "4H project". And just to clarify, my guinea pigs are not currently involved in 4H at all, they were not my "4H project". I understand people have different opinions on 4H, and I respect that. So, we all go to a 4H show in August, where we present our animals from the farm. We show our farm animal (I have a chicken named Maple, chickens rock! :>), and we have the option to show another animal not at the farm- including guinea pigs. I have talked to Jasmine and Pigsy's current caretaker, she says that I should do some research on the topic and get back to her. She said that she would trust me with them for a few hours during the show. The thing is, I'm worried about bring them. I know someone that will teach me all the moves- if I plan on doing it- but I'm nervous that they will catch something from the other pigs there, or get too stressed out. Do you have an opinion or tips? Also, I don't know if they can be shown with fungus on their feet. Their caretaker says she continued their chlorhexidine treatment for a little over a week after I gave them back, and that she couldn't keep up with it. She's really busy, she owns a large farm. They now have quite a bit of fungus on their feet. I don't know if I will get points taken off because of their fungus, or if it's even fair to take them to a show where they could give the other pigs fungus. I talked to her about possibly doing something like a pill, like Program, instead, if that would take less time. She didn't give me a definite answer, she said she might be able to. I'm not worried about their fungus for the show, I'm also very worried because many small children and tons of visitors come to the farm every day. I'm worried about them getting sick. And also, she doesn't take them for yearly vet visits, so I don't have a vet to discuss this with. Do you think Program would be worth it? Is it a hassle getting them to eat it? FYI, she takes very good care of them. She has them in a 2 x 4 c&c cage, and feeds them oxbow, timothy hay, and personally grows fresh veggies to give to them daily. We both have worked very hard to give them the best care possible. If there is a foot fungus, sounds like showing them would be a bad idea. p.s. I was a 4H-er years ago. Hey, all! Sorry I never uploaded the pictures. I don't have a picture- we gave them back to the farm, so we don't see them very often. 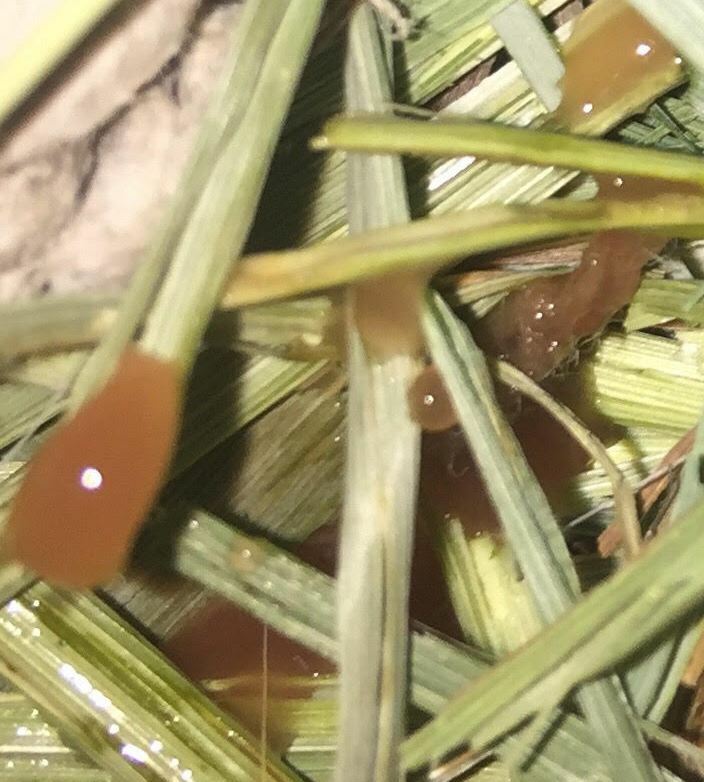 I'm pretty sure it's fungus- it looks like what was under Jasmine's toenail, if you look back in the thread you can see it, but it's on the edge of their foot pad, and it's also under Jasmine's nail. It doesn't seem to cause them any pain, and we both tried to treat it for many months, and it didn't do away. we think it might just be humid air or something in the cage, and we're not too worried about it anymore. I pretty sure I'm not going to show them. Anyway, that wasn't the main thing I am worried about. Today I walked into the farm store and saw the piggy cage. They were almost out of water, and in there water there was black stuff (poop? mold?). I learned that the person who normally takes care of them is on vacation. It surprised me that they were like this because their owner takes very good are of them (4 by 2 c&c cage, oxbow, daily veggies, etc). After that, I weighed them. I don't usually weigh them, the second to last time I did was right before we gave them up, when Jasmine was about 1200g and Pigsy was about 1000g. The last time I weighed them, I think that Jasmine was around 1000g and Pigsy was around 900g. I just weighed them today. Jasmine was 868g and Pigsy was 970g. Also, Jasmine has always been heavier than Pigsy. I don't know if losing a little under 200g in 2 months is worrisome- she was eating lettuce and carrots when I was there, and had clear eyes, no running nose, no wheezing. She seemed totally normal. Also, she seemed the same size, not boney or any less fat as she was before, she has always been a little chubby and still is. I talked to a reliable person who said they would weigh her and keep an eye on her, however she doesn't know very much about guinea pigs, and only goes to the farm on Saturday and Sunday. I usually go once a week but am going to sleep away camp so I won't be able to help her. My parents thought that it might be because they might be feeding her less, but then Pigsy would be very light too. This might all be because Jasmine didn't want to drink the dirty water and was severely dehydrated, I'm not really sure but I got a new water bottle and filled it up. I'm sure what I should do- she's acting normal, and still eating. If I still had her, I would take her to the vet, except she's not my guinea pig, and her owner is on vacation. I also have no idea about what could be causing this weight loss, I'm worried that it's a medical condition or sickness because Pigsy hasn't lost a lot of weight like Jasmine has. Ideas? Opinions?